This consecration was written by Pope Leo XIII in 1899. 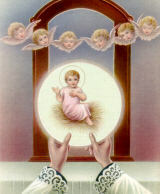 Most sweetJesus, Redeemer of the human race, look down upon us humbly prostrate before Thine altar. We are Thine, and Thine we wish to be; but, to be more surely united with Thee, behold each one of us freely consecrates himself today to Thy most Sacred Heart. Many indeed have never known Thee; many too, despising Thy precepts, have rejected Thee. Have mercy on them all, most merciful Jesus, and draw them to Thy most Sacred Heart. Be Thou King, 0 Lord, not only of the faithful who have never forsaken Thee, but also of the prodigal children who have abandoned Thee; grant that they may quickly return to their Father's house lest they die of wretchedness and hunger. An Our Father and a Hail Mary for the dying and for sinners. An Our Father and a Hail Mary for the world-wide triumph of the Sacred Heart, especially by daily Mass and Communion. An Our Father and a Hail Mary for the special intentions of all present. An Our Father and a Hail Mary for our country. Five times in honor of the Saviors' Five Wounds: Most Sacred Heart of Jesus, Thy Kingdom come!